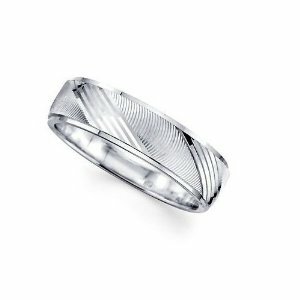 Have a permanent reminder of your special day forever with this solid 14k white gold band ring. Suitable for men or women this diamond razor cut high polish wedding ring is 6mm wide and is authenticated with a 14k stamp. Available sizes: 6, 7, 8, 9, 10, 11, 12, 13 and 14.